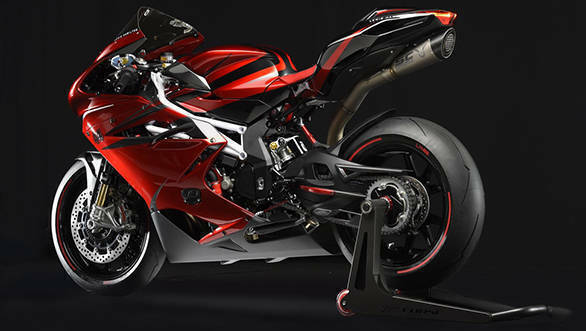 MV Agusta has stated it will stop production of its flagship F4 superbike at the end of 2018. The present F4 doesn't meet current European emission norms and cannot remain on sale legally beyond 2018. Tougher emission norms are coming into effect in Europe from 2020, which is also when the company will reveal a new four cylinder flagship unrelated to the present motorcycle. This generation of the F4 is powered by a 998cc four cylinder motor which puts out 205PS and 115Nm. This is mated to a 6-speed manual transmission. Priced at Rs. 25.99 lakhs (ex-showroom Delhi), the bike has a top speed of 302 kmph. The Italian motorcycle manufacturer has faced a tough financial situation in the recent past and this step could also be a measure to cut costs. MV Agusta is also looking to introduce its new four-cylinder engine platform in its Brutale, Dragster and the Turismo Veloce range of motorcycles in the next two years, with the Brutale coming first in 2018 itself. These model lines sell in larger numbers and will let the company achieve better economies of scale. The F4 successor will be the last bike to be launched on this new platform. In a recent interview with Overdrive, Giovanni Castiglioni, the head of MV Agusta, stated that in the last five years the company had had a 30 per cent rate of R&D over revenue and going forward, research and development would keep playing a major role in the company's strategy. He also reiterated that MV Agusta would still be more active in the higher end of the market and look to improve quality.